Saxony or velvet carpets are generally used in formal settings. They have a fine cut surface that gives you a luxurious look; this type carpet definitely shows footprints. A textured saxony is constructed so that subtle tone variations in the carpet conceal footprints. They are there, but the construction fools the eye. You can use any combination of these constructions depending on the look you want to achieve. A plush carpet is appropriate for informal room schemes. Plush carpets, like a saxony are level-cut pile but with generally higher pile heights and not usually as dense as a saxony. A texture carpet is especially suitable for less formal decors.This type of carpet is made from curled or twisted tufts that provide a smooth texture that hides footprints well. Cut-loops are also suited for informal settings.A cut-loop carpet yarns are tufted into large islands of high cut tufts and lower loop tufts to form a sculptured pattern. This construction is usually made up of many colors for greater soil hiding and design flexibility. Level loop carpet is great for high-traffic areas and informal settings. This is a simple loop pile with equal height tufts. Its durable construction is what you normally think of as “commercial” carpet, but it is being used more and more in kitchens, playrooms, and great rooms. Larger loops characterize the Berber style. Berbers traditionally have been made of wool and have been quite expensive. Many manufacturers use polypropylene fiber to make beautiful Berber and Sisal carpet at affordable price. Multi-level loop is appropriate for a variety of different schemes including informal settings. 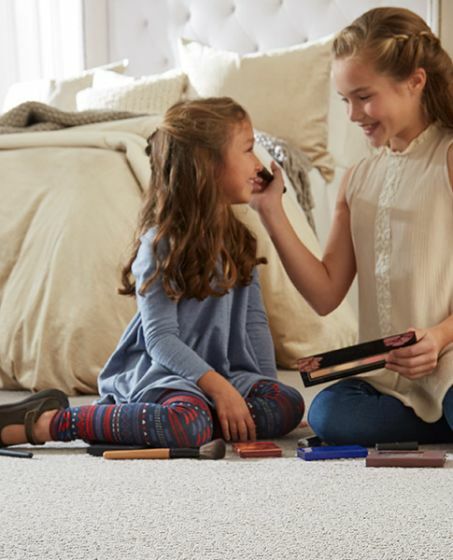 This multi-level loop pile carpet has two to three levels of tufts forming random sculptured surfaces, typically in the large loop Berber style..
Frieze carpet is especially suited for high-traffic areas. A type of textured carpet with highly twisted tufts that curl at the carpet pile’s surface. There are many types of padding available in various thickness and weight. The padding is an integral part of your floor system and affects both wear and comfort. Our sales professionals will be able to recommend a pad suitable for your home after they determine the traffic patterns in your home. There are 4 major fibers used to make residential carpet yarn-wool, nylon, polypropylene and polyester. Wool is the oldest and most expensive fiber used to make carpet. It is a natural fiber derived from the fleece of sheep and is found in fine oriental rugs and also very expensive woven rugs. Nylon is by far the most widely used man-made fiber in tufted residential carpet. It is very durable and accepts dye well, allowing for a wide range of colors and styles. Polypropylene (olefin) is also a man-made fiber best suited for berber styling. It is water and stain resistant and very durable. Polyester is sometimes used in carpet. It is a very soft fiber and should be used only in low traffic areas. There will be four prominent considerations in your mind – your budget, the color you need, the type carpet you want, and a question if the carpet you select will last. Our sales professionals are knowledgeable about carpet and will help guide you to selections that meet your requirements. Give them as much information as possible. Tell about your family including how many people and ages, which will enable them to determine the best carpet for your traffic patterns. Explain which rooms you wish to carpet and the approximate sizes. If possible, bring a fabric swatch to help in color selection. You will see much confusing information about carpet. Ultimately what should be important to you are the written warranties covering the carpet you purchase, since this is the manufacturer’s promise and commitment to you. Many manufacturers give each product line a grading based on the warranties and how they know the carpet will perform. These grades are NOT based on price; they are derived from the many variables involved in manufacturing carpet. It is your written assurance that the carpet will last and retain its appearance. This allows you to select your new carpeting based on color and aesthetics.